Baby diver: The Sequel – Let the diving begin! UNLIKE MANY MARINE SPECIES (hello Mr Seahorse), the female does all of the heavy lifting when it comes to human pregnancy, and us males can only do our best to be supportive. When conversation turns to the marine world, divers’ eyes light up, and they just can’t help but try to convey the wonder of the underwater experience to their audience. In fact they usually can’t help but try to convert all those who cross their path to the diving cause. This unusual level of passion is something we should celebrate – I can’t think of any other hobby in which the participants are so passionate in their belief that non-divers are missing out terribly on some of the Earth’s greatest wonders. So it’s only natural that we divers wish to share the experience with our family. This article is about how you can get your children or grand-children to follow you into the water as soon, and as comfortably, as possible. Enforced breaks from diving are a gut-wrenching experience and, last year, while Jade was pregnant, I wrote an article about the rules and research behind scuba-diving while carrying a child (Baby Diver, September, 2017). Sadly, the headline was that taking a break from scuba-diving is pretty much unavoidable for mums-to-be. Naturally, once our daughter Apolline was born we were soon wondering when we could get her into the water. With PADI, the earliest a child can get on scuba is at eight. That’s a Bubblemaker course in confined water, and at 10 they can undertake the Junior Open Water course. With BSAC, the minimum age for an Ocean Diver course is 12. When I was an instructor, I noticed a dramatic difference in students’ ability to assimilate scuba-diving, which led me to devise the concept of “water miles”. This is quite simply the amount of time an individual has spent in and around bodies of water – everything from splashing about in a pool to going surfing or snorkelling. The conclusion was simple: those with a lot of water miles are in a much better position to pursue scuba-diving. For students who had a long history of spending time in the sea, scuba added only one new element of equipment and skills to the equation. In comparison, for students who had never even snorkelled, the challenge of learning how to dive was far greater, and the open ocean a far more daunting environment. In extreme cases, particularly while working in South-east Asia, I would take clients for Discover Scuba dives who couldn’t even swim! In much the same way that you might sign up for a tandem sky-dive, the scuba experience was part of their lifelong bucket-list. Of course, unlike jumping out of a plane, there are a few things you can practise before going straight to breathing under water, and we were keen for Apolline to start accruing her water miles as early as possible. We also wanted to ensure that our child’s safety was never endangered, and so decided it was best to sign up for a formal infant swimming class, run by an organisation called Water Babies. THE FIRST BIG QUESTION concerned whether a baby could go swimming before its eight-week vaccinations. I’m pleased to report that the latest NHS guideline is that a baby can go swimming at any age, before or after being vaccinated. A more crucial consideration, particularly for those tempted to dip their newborn child in British waters, is ensuring that the water temperature is a toasty 32°C for babies under 12 weeks or 30°C for those over 12 weeks old. We turned up for our first half-hour lesson at a pool on the outskirts of Exeter that was filled with the cacophony of tiny voices. With all the steam emitted from the tropically heated pool, it felt like stepping into a sauna. Just like school, the classes are run over three terms, and you must sign up for a set of 12 weekly classes at a time. In fact, you have to commit to the next term within a few weeks of the prior term starting, which is a sign both of the classes’ popularity and the highly commercialised experience on offer. Our class comprised six babies, each allowed one accompanying parent in the pool. The teacher learns the baby’s names but not yours; from now on I would be known as “Apolline’s dad”. Babies instinctively use the laryngeal reflex to hold their breath under water. We quickly grew to love our instructor Kirsty’s teaching manner, comprising a well-balanced mix of calm authority and friendly fun. With no time to waste, we were quickly off with warm-up exercises, walking in a circle with babies in outstretched arms, bouncing them this way and that in the warm water. We then started habituating them to immersion and breath-holds by saying: “Apolline, ready, go”, and then splashing their face with water. Apolline was two months old at this point, and seemed slightly puzzled by the whole experience! During the very first class, the babies also completed their first full immersion, with Kirsty repeating the “name, ready, go” mantra before very briefly putting Apolline under and then back up. Some of the babies cry on their return to the surface while others stay cool, but it is often the parents who are most nervous. The important thing to remember is that while, to the uninitiated, it may appear cruel, this class is actually tapping into an innate set of instincts designed to prevent humans from drowning. At this point in their learning, the babies are relying on their laryngeal reflex (also known as the gag reflex). When sensing the feeling of water on its face, nose, throat and voicebox, the baby instinctively holds its breath and soft tissue seals the back of the throat to prevent any water ingression. Thanks to the laryngeal reflex, you will often see babies under water with their mouths open, which can look a bit shocking but is perfectly normal. This reflex is strongest in the first six months of a child’s life, before gradually wearing off by its first birthday. As such, starting swimming early is easier for babies, because the laryngeal reflex is still strong. ON TO THE SECOND CLASS, and the pace for both parents and baby was relentless. With tightly grouped, back-to-back classes, one set of infants would swiftly exit the pool to be replaced by another, and there wasn’t much time for chit-chat. I was surprised to find that these classes pushed our baby harder than I would have, even as someone who makes a living in the water. This elicited mixed feelings: partly a sense of protectiveness over our little Apolline, and partly an appreciation that Water Babies was really providing us with a level of teaching and experience that I couldn’t mimic on my own. As the term goes on, I find that on some days Apolline has more energy and enthusiasm for the class than on others, and adjust how intensely we participate as a result. AS THEY BUILD UP their experience, the idea is that the infants move away from the involuntary laryngeal reflex to a conscious breath-hold. It is one of the proudest moments of my life as a parent to watch as, following an “Apolline, ready, go”, my baby daughter holds her breath in preparation, drops under water with me and then swims (or perhaps floats) up, surfacing with a smile on her face! It is once we start these conscious breath-holds that the mammalian dive reflex comes into play, a function with which divers, and in particular freedivers, will be more familiar. Also known as the diving response, this is a reflex we share with dolphins and other water-dwelling mammals whereby, when our faces are immersed in cool water, our heart-rate slows and blood pools around the core organs. This enables our body to function more efficiently in an oxygen-deprived situation and, practically speaking, means that you can hold your breath for longer. There is a common misconception that it is the mammalian dive reflex that allows babies to hold their breath and that it will be lost over time, but it is the laryngeal reflex that is actually the critical player, and you never lose the mammalian dive reflex, although you can enhance its effects with training. After her first term of lessons, Apolline’s comfort level in the water and progress are tangible and a source of huge pride to her parents. 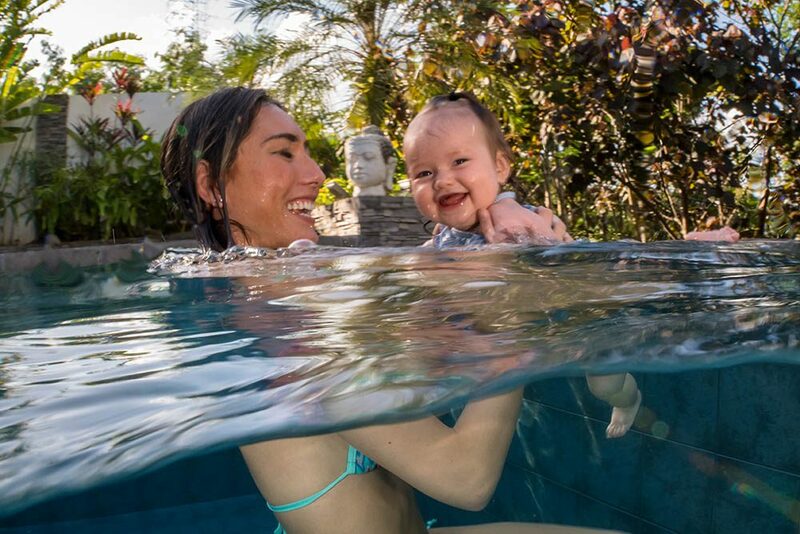 Infant swimming has only really entered the mainstream over the past couple of decades, and a baby’s ability to comfortably hold its breath under water often comes as a surprise to the uninitiated. The images we take of Apolline under water prove a surefire way of wowing friends and family! There has been little research into thee effects of infant swimming, but the early signs are that it benefits children beyond accruing water miles. 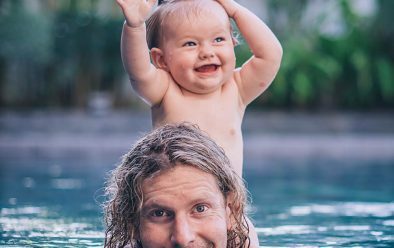 A Norwegian study showed that baby swimmers have better balance and are better at grasping things than non-swimmers, while German research found that swimming babies had more advanced motor development, social skills and intelligence than non-swimmers. However, a Brazilian study published this year could discern no difference in performance between swimming and non-swimming babies, so there isn’t a concrete body of scientific evidence just yet. a father and unable to enjoy the bonding benefits of breast-feeding! As parents, we were delighted with the impact swimming lessons had on our baby daughter. While at times the classes felt a bit like being part of a factory line of parents and babies, the effect in terms of Apolline’s comfort level in the water was undeniable. The classes have also given me some of my proudest moments as a parent so far, and, without wishing to stray into overbearing father territory, seeing our little girl thriving in the water was fantastically enjoyable and gave us great hope for her scuba-diving career ahead! WATER BABIES runs classes nationwide, waterbabies.co.uk. Prices vary but Henley and Jade paid £155 per term. While the classes equip infants with certain skills and comfort in the water, they do not replace adult supervision, which must be present at all times when infants are swimming.